Oh the culinary wonders of versatile soup! 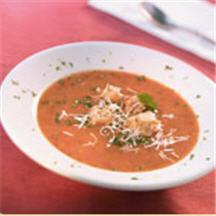 It can be the appetite-whetting first course, the warm-you-up "meal-in-a-bowl" or a cool, refreshing spoonable dessert. 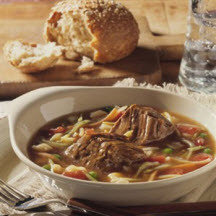 CooksRecipes has quality, kitchen-tested recipes for hot and hearty soups, chilled soups, stews, chowders, bisques, gumbos, minestrones, ragouts, jambalayas, paellas and pozoles that you can count on for accuracy and deliciousness. This superb recipe for roasted tomato and jalapeño chile soup was created by Chef Ben Berryhill. 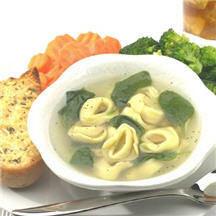 Three cheese tortellini and tender baby spinach leaves in a flavorful chicken broth are a perfect combination for an easy light lunch or early supper. Put this make-ahead soup on early in the day to serve an easy, near-effortless "meal-in-a-bowl" that evening.